Sequlation is a set of 128 Presets for the Dave Smith Instruments Evolver with the intention of providing a professional & creative set of musically useful Sequences. 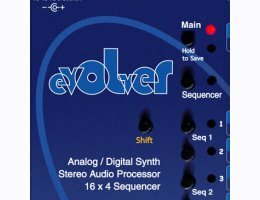 The Evolver can be a wild beast capable of extreme insanity, this collection sets out to prove it also has a calmer musical side, but of course each preset can easily be coaxed back to the brink if you so wish. The Sequences cover a broad spectrum of styles, and are also excellent starting points for adapting to your own style. Aftertouch and Mod Wheel assignments are used throughout for real time manipulation.